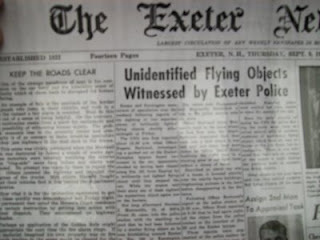 The Exeter UFO Incident, Almost 50 years later and it is still unsolved! The Exeter incident was a highly-publicized UFO sighting that occurred on September 3, 1965 approximately 5 miles from Exter, New Hampshire, in the neighboring community of Kensington. Although several separate sightings had been made by numerous witnesses in the weeks leading up to September 3, the specific incident, eventually to become by far the most famous, involved a local teenager and two police officers. The Exeter incident remains listed as unexplained by the U.S. Air Force. At approximately 2 am on September 3, 1965, Norman Muscarello was hitchhiking to his parents' home in Exeter along Highway 150. Muscarello, 18, had recently graduated from high school and was about to leave for service in the U.S. Navy. He had been visiting his girlfriend at her parents' home in nearby Amesbury, Massachusetts; since he did not own a car he would catch a ride to and from his girlfriend's home. However, at that time of night there was little traffic on the highway, and as he walked he noticed 5 flashing red lights in some nearby woods. The lights illuminated the woods and a nearby farmhouse (the farm belonged to the Dining family, who were not at home at the time). The lights soon moved towards him, and Muscarello became terrified and dove into a ditch. The lights moved away and hovered near the Dining farmhouse before going back into the woods. Muscarello ran to the farmhouse, pounded on the door and yelled for help, but no one answered. When he saw a car coming down the road, he ran into the road and forced it to stop. The couple in the car drove him to the Exeter police station. At the station Muscarello told his story to police officer Reginald Toland, who worked the night desk at the police station. Toland, who knew Muscarello, was impressed by his obvious fear and agitated state. Toland radioed police officer Eugene Bertrand, Jr., who had earlier in the evening passed a distressed woman sitting in her car on Highway 108. When Bertrand stopped and asked if she had a problem, the woman told him that a "huge object with flashing red lights" had been following her car for 12 miles and stopped over her car before flying away. Bertrand considered her a "kook" but did stay with her for approximately 15 minutes until she had calmed down and was ready to resume her drive. 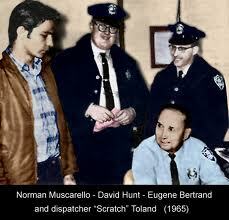 After arriving at the police station and hearing Muscarello's story, Bertrand decided to drive back to the Dining farm with Muscarello to investigate the field where he had seen the UFO. Bertrand drove Muscarello back to the place of his sighting. From Bertrand's patrol car they saw nothing unusual. 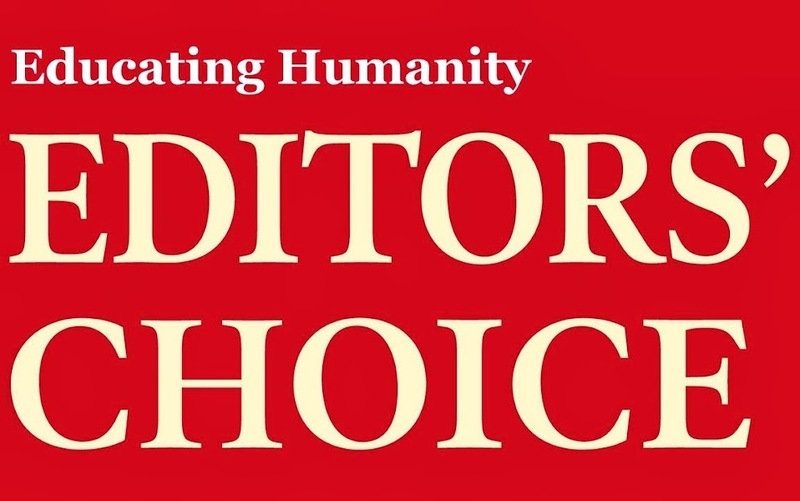 However, when they left the car and walked towards the woods where Muscarello had first seen the objects, some horses in a nearby corral began kicking their stalls and making loud, frightened noises. Dogs in the area also began howling. Bertrand and Muscarello both saw an object rise up from the woods beyond the corral. Bertrand described the UFO as "this huge, dark object as big as a barn over there, with red flashing lights on it." The object moved slowly towards them, swaying back and forth. Instinctively remembering his police training, Bertrand dropped to one knee, drew his pistol, and pointed it at the object. He then decided that shooting would not be wise, so he reholstered the pistol, grabbed the stunned Muscarello, and both men ran back to the patrol car. Bertrand radioed another Exeter policeman, David Hunt, for assistance, and while the two men waited for Hunt to arrive they continued to watch the object. According to UFO historian Jerome Clark, Bertrand and Muscarello "observed the object as it hovered 100 feet away and at 100 feet altitude. It rocked back and forth. The pulsating red lights flashed in rapid sequence, first from right to left, then left to right, each cycle consuming no more than two seconds...the [local] animals continued to act agitated." When Hunt arrived he also watched the strange object. The object finally flew away over the woods and disappeared. Hunt soon saw a B-47 bomber fly overhead and he later told journalist John Fuller that "You could tell the difference" between the UFO and the bomber, "there was no comparison." All three men drove back to the Exeter police station and immediately filed separate reports on what they had seen. Bertrand then drove Muscarello home and told his mother what had happened. The sightings by Muscarello and the two policemen received national publicity. John Fuller, a journalist and regular columnist for Saturday Review magazine, decided to travel to Exeter and investigate. Fuller interviewed a number of people in the Exeter area who also claimed to have witnessed strange lights and unusual objects. Among them were Ron Smith, a senior at the local Exter High School, who told Fuller that about two or three weeks after Muscarello's sighting, he was riding with his mother and aunt one evening at 11:30. According to Smith, he, his mother and aunt all saw an object with "a red light on top and the bottom was white and glowed. It appeared to be spinning. It passed over the car once and when it passed over and got in front, it stopped in midair. Then it went back over the car again." Fuller also spoke to police officer Toland at Exeter's police station. Toland told Fuller of a number of calls he had received from Exeter-area residents regarding UFO sightings. A good example of the type of calls Toland had received came from Mrs. Ralph Lindsay. According to Toland "she called in here early, just before dawn. She said it was right out her window as she was calling. It was like a big orange ball, almost as big as the harvest moon...and it wasn't the moon, either...all the time she was talking to me, her kids were at the window watching it. Now why would people go to all this trouble - people all over the area - if they weren't seeing something real"? When Exeter's police chief read the reports of Bertrand, Hunt, and Muscarello he called nearby Pease A.F. Base and reported a UFO sighting. The Air Force sent Major David Griffin and Lieutenant Alan Brandt to interview the three men. The Air Force officers asked all three men to not report their sighting to the press, but since a reporter from the Manchester Union Leader newspaper had already interviewed them, it was too late. Major Griffin sent a report of the incident to the staff of Project Blue Book, the official Air Force research group assigned to study UFO reports. Griffin wrote that "At this time I have been unable to arrive at a probable cause of this sighting. The three observers seem to be stable, reliable persons, especially the two patrolmen. I viewed the area of the sighting and found nothing in the area that could be the probable cause. Pease AFB had five B-47 aircraft flying in the area but I do not believe that they had any connection with this sighting." Muscarello, Bertrand, and Hunt all strongly disagreed with the Air Force explanation. 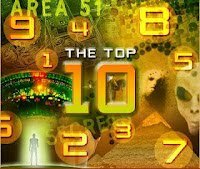 The two policemen sent a letter to Project Blue Book in which they stated, "As you can imagine, we have been the subject of considerable ridicule since the Pentagon released its 'final evaluation' of our sighting of September 3, 1965. In other words, both Patrolman Hunt and myself saw this object at close range, checked it out with each other, confirmed and reconfirmed that it was not any type of conventional aircraft...and went to considerable trouble to confirm that the weather was clear, there was no wind, no chance of weather inversion, and that what we were seeing was in no way a military or civilian aircraft." 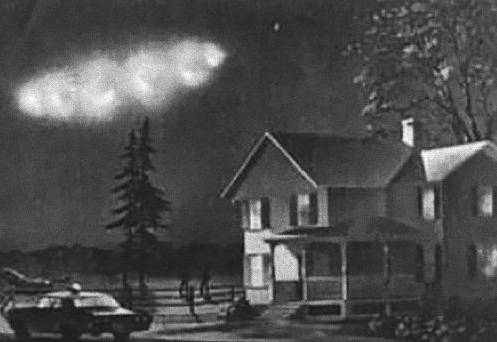 Bertrand also noted that their UFO sighting took place nearly an hour after Operation Big Blast was said to have ended, which eliminated the operation as a possible cause of the sighting. When Project Blue Book did not respond to their letter, on December 29, 1965 - nearly four months after the sighting - the two men sent another letter to Blue Book in which they wrote that the object they observed "was absolutely silent with no rush of air from jets or chopper blades whatsoever. And it did not have any wings or tail...it lit up the entire field, and two nearby houses turned completely red." In addition to Muscarello and the policemen, John G. Fuller also ridiculed the Air Force explanation in print. He wrote that he had observed an unusual object near Exeter himself, and that it was being chased by an Air Force jet fighter. 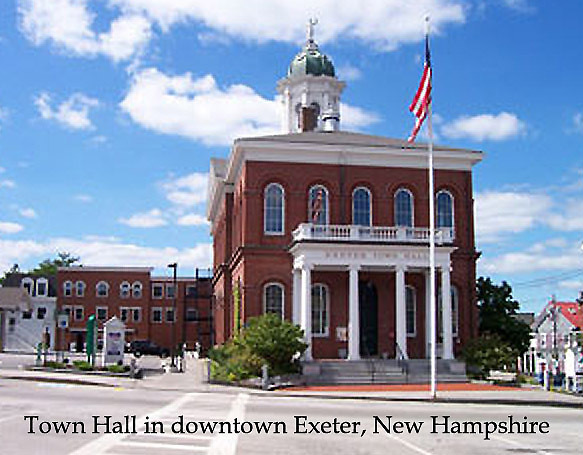 Raymond Fowler, the New England investigator for the Nat'l Investigations Committee on Aerial Phenomena (NICAP), also filed a detailed report on the Exeter sightings. In his view the Air Force explanation was also incorrect. At one point an Air Force officer claimed that the UFOs people had been observing were merely lights from nearby Pease AFB. To prove it, he had the lights activated before a large crowd who were gathered some distance away. According to Fowler, "he ordered personnel at the base to turn the lights on. Everybody looked and waited - and nothing happened. Frustrated, he yelled into the mike to turn on the lights. A voice replied that the lights were on. The very embarrassed officer slunk back into the seat of the staff car and drove off amongst the laughs and jeers of the crowd." In January 1966 Lieutenant Colonel John Spaulding, from the Office of the Secretary of the Air Force, finally replied to the policemen's two letters. Spaulding wrote that "based on additional information submitted to our UFO investigation officer, Wright-Patterson AFB, Ohio, we have been unable to identify the object you observed on September 3, 1965."